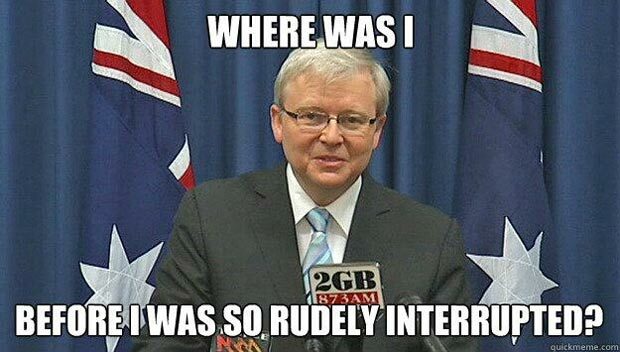 Kevin Rudd: Where was I before I was so rudely interrupted? Kevin Rudd was elected as the 26th Prime Minister of Australian in 2007. Then, in 2010, he was “interrupted” by his deputy, Julia Gillard, who with the help of the infamous “faceless men”, “knifed” him as leader of the Labor Party, and went on to become Australia’s first female prime minister. Then, in 2013, after several failed attempts by Kevin Rudd, he again “knifed” Julia Gillard who had become one of the least popular prime ministers in recent history, in part due to having deposed Kevin Rudd in the past. Created about 5 yrs, 9 mths ago (June 26, 2013). Updated about 5 yrs, 5 mths ago (November 14, 2013).